The open test or business component. AddNewAction Creates a new action with the specified script content and adds call to it from the test. CheckIn Checks in a test or component to the ALM version control system. CheckOut Checks out a test or component from the ALM version control system. Close Closes the current test or business component and opens a new, blank test or component. Continue Continues the run session. GetAssociatedAddins Retrieves the list of add-ins associated with the test or business component. Pause Pauses the run session. Run Runs the open test or business component and creates results in the specified file or ALM path. 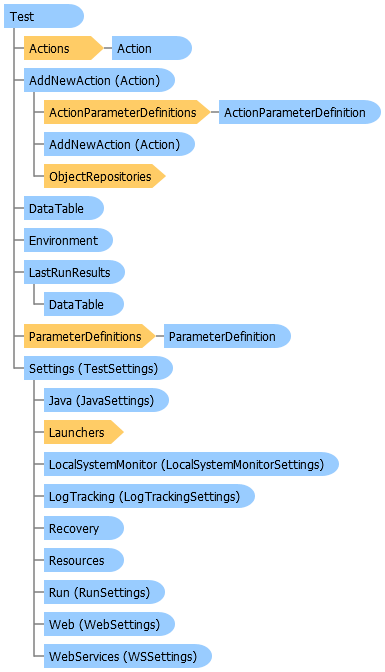 RunAction Runs a specific action from the open test and creates results in the specified file or ALM path. RunDebug Runs the open test or business component in debug mode and creates results in the specified file or ALM path. Save Saves the test or business component. SaveAs Saves the test or business component with a new name. SaveTestWithResources Saves the test with its resources. SetAssociatedAddins Specifies the list of add-ins associated with the test or business component. Stop Stops the run session. UpdateRun Runs the test or business component in update mode. ValidateAddins Indicates whether all add-ins associated with the open test or business component are currently loaded, that all interdependent add-ins are loaded, and that there are no conflicts between loaded add-ins. Actions Returns an Actions collection representing all actions called in this test. Author The name of the author of the open test or business component. CreatedInVersion The UFT version in which the testing document was created. CreatedOnDate The date and time when the testing document was created. DataTable Returns the runtime data table, which enables you to modify the data that is used for the Data pane parameters in your test or ALM configuration. Description The textual description of the test or business component. Environment Returns an Environment object, which enables you to set the values of environment variables. IsNew Indicates whether the test or business component is currently untitled. IsRunning Indicates whether the open test or business component is currently running. LastRunResults Returns the LastRunResults object, which contains the most recent run results for the test or business component. Location The location (file or ALM path) of the test or business component. Modified Indicates whether the test or business component has been modified since it was last saved. ModifiedInVersion The UFT version in which the testing document was last modified. ModifiedOnDate The date and time when the testing document was last modified. Name The name of the open test or business component. ParameterDefinitions Returns the ParameterDefinitions collection defined for the test or business component. Settings Returns a TestSettings object, which enables you to configure test- and component-specific settings. VerCtrlStatus The test status for the version controlled test.